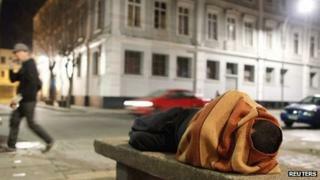 Freezing temperatures in central and southern Chile have led to the deaths of 16 homeless people so far this year, officials say. The latest deaths were at the weekend when two victims were found in the capital, Santiago. Temperatures in some parts of the city dropped to -8C, but forecasters said the cold snap was set to ease. Chile has some 12,000 homeless people, about half of them in the capital, Santiago. Chilean President Sebastian Pinera said that if people were aware of someone living on the streets to "please make the effort to get them to the shelters we have provided". He said that the provision of accommodation had helped reduce the number of fatalities during the Southern Hemisphere winter. Cold weather led to more than 150 deaths in 2010, while last year there were some 50.